Blackberries thrive best on fertile, well-drained soil in full sun. The plants will tolerate part shade but yield and sugar content will be diminished. Periods of high rainfall or overzealous irrigation during the ripening phase can also lead to a less sweet crop. While easily grown, they can become a management challenge if not maintained. It is their nature to sprawl and growth is rapid so consider a trellising system and a regular pruning regime to remedy what can quickly become a blackberry jungle. Erect and semi-erect types of brambles may only require some tip pruning and heading back to keep vines from covering too much garden space and hindering harvest, but trailing types benefit most from trellising to get the fruit off the ground. Pruning tips and trellising systems are addressed thoroughly in this publication from the University of Kentucky. While erect types are the easiest to maintain, flavor and sweetness can be subjective and growers will benefit from experimentation with an assortment of varieties. At the UT Gardens, Knoxville, Kitchen Garden a trailing variety called ‘Triple Crown’ has been the crowd favorite for more than five years due to heavy production of sweet, flavorful berries. The University of Arkansas is a leader in breeding blackberries, developing cultivars that have improved flavor, production, disease resistance, and minimized maintenance. 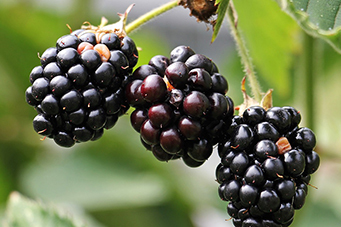 Of course, thornlessness has been addressed and several varieties are available as well as a relatively new group of blackberries that will produce on the first year canes, which revolutionizes commercial blackberry production. Recommended University of Arkansas cultivars that produce on floricanes (second year) are named for Native American Indian tribes, and those that will produce on the primocanes will have the prefix ‘Prime” attached to the name. The University of Arkansas resources are included here as a starting point. Additional information about blackberry production can be found online at the UT Extension publications page: extension.tennessee.edu/publications. Just enter "blackberries" into the search engine.